Joe Takehara sensei and Chicago Aikido Club at Ravenswood Shorin-ryu Karate Dojo. 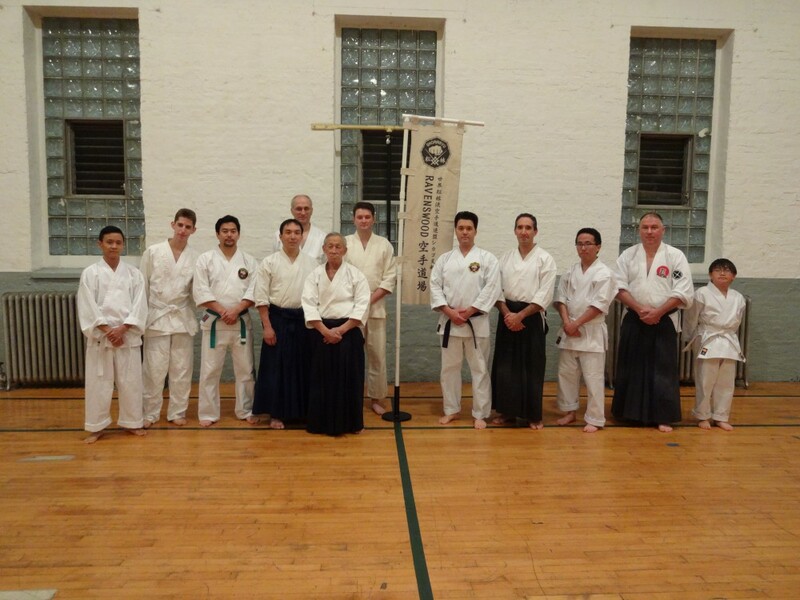 On October 6th, we were honored to host Joe Takehara sensei, a charter member of the old Illinois Aikido Club. IAC, founded in 1961 by a small group of Nisei professionals in Chicago Police Detective Tony Muranaka’s basement, was the first aikido dojo in the Midwestern United States. Initially learning from a book by Koichi Tohei, then Chief Instructor of Aikido World Headquarters in Tokyo, the club would go on to host such luminary in-house instructors as Chester Sasaki, Francis Takahashi, Motokage Kawamukai, Isao Takahashi, Yoshihiko Hirata, Akira Tohei, and Shigeru Suzuki. 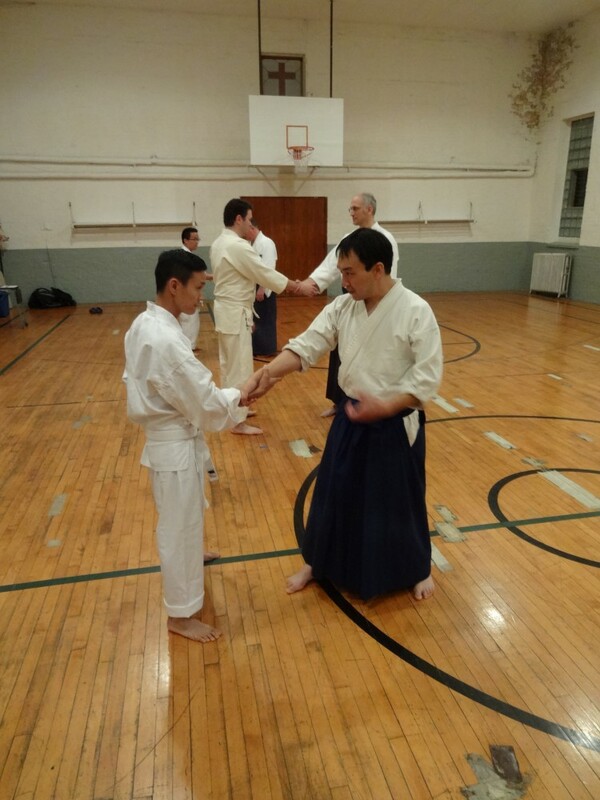 Takehara sensei demonstrates aiki principles with Ravenswood Dojo member Ryan Yokota. As a special treat, the Chicago Aikido Club – where Takehara sensei occasionally instructs today – cancelled their scheduled Monday class to attend our dojo in support of this goodwill exchange. We shared a couple warm-ups and basics of karate, then handed the floor over to Takehara, who introduced some advanced concepts of applying technique through kimochi (feeling), relaxation, and proper breathing. A former boxer and gymnast, Takehara took up the practice of aikido shortly after starting a dental practice located across the street from Muranaka’s home. Like his contemporaries, he was not so much interested in the physical aspects of the art as the mental and spiritual side that would help him center and settle his energies for enhanced focus in his career and family life. Special guest Jason Matsumoto, of Chicago-based Ho Etsu Taiko – “a collective of musicians with a fresh take on the art of Japanese drumming” – also happened to stop by the dojo for some training. 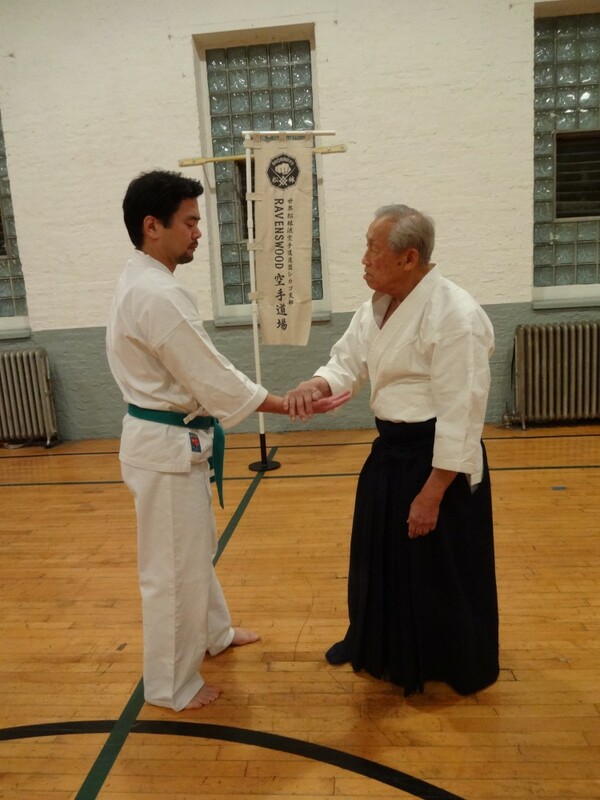 Here he works with Chicago Aikido Club manager Dwight Sora. At 83-years of age and plenty genki to join us for a post-practice hamburger and beer, Joe Takehara is an exemplar of traditional budo. The fact that his vehicle for expression is aikido and our chosen vessel is karatedo makes no difference. We are grateful for this rich experience and look forward to future such exchanges. 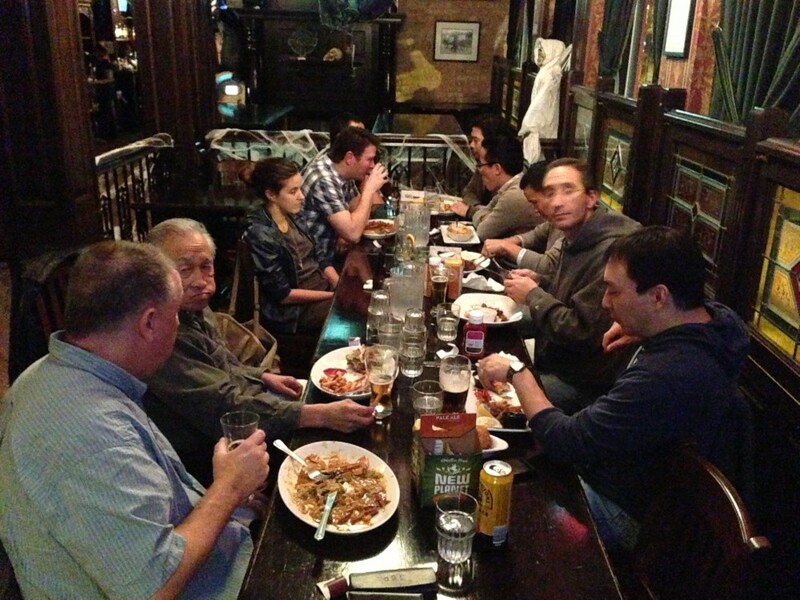 Post-practice pub grub at O’Shaughnessy’s Public House, around the corner. Most importantly, we all had fun.